Antarctica is a part of Earth and consists of the following regions: Antarctica, French Southern and Antarctic Lands, Bouvet Island, Heard Island and Mcdonald Islands, South Africa, South Georgia and The South Sandwich Islands. See Antarctica interactive map with the information about travelling to Antarctica. Want to travel to Antarctica on your own? Are you looking for more travel information about Antarctica? 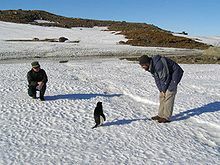 Wikipedia about Antarctica: Antarctica on our wiki pages. Antarctica (UK: /ænˈtɑːrktɪkə/ or /ænˈtɑːrtɪkə/, US: /æntˈɑːrktɪkə/ ( listen)) is Earth's southernmost continent. It contains the geographic South Pole and is situated in the Antarctic region of the Southern Hemisphere, almost entirely south of the Antarctic Circle, and is surrounded by the Southern Ocean. At 14,000,000 square kilometres (5,400,000 square miles), it is the fifth-largest continent. For comparison, Antarctica is nearly twice the size of Australia. About 98% of Antarctica is covered by ice that averages 1.9 km (1.2 mi; 6,200 ft) in thickness, which extends to all but the northernmost reaches of the Antarctic Peninsula. Antarctica, on average, is the coldest, driest, and windiest continent, and has the highest average elevation of all the continents. Antarctica is a desert, with annual precipitation of only 200 mm (8 in) along the coast and far less inland. The temperature in Antarctica has reached −89.2 °C (−128.6 °F) (or even −94.7 °C (−135.8 °F) as measured from space), though the average for the third quarter (the coldest part of the year) is −63 °C (−81 °F). Anywhere from 1,000 to 5,000 people reside throughout the year at research stations scattered across the continent. Organisms native to Antarctica include many types of algae, bacteria, fungi, plants, protista, and certain animals, such as mites, nematodes, penguins, seals and tardigrades. Vegetation, where it occurs, is tundra. Aristotle wrote in his book Meteorology about an Antarctic region in c. 350 B.C.Marinus of Tyre reportedly used the name in his unpreserved world map from the 2nd century A.D. The Roman authors Hyginus and Apuleius (1–2 centuries A.D.) used for the South Pole the romanised Greek name polus antarcticus, from which derived the Old French pole antartike (modern pôle antarctique) attested in 1270, and from there the Middle English pol antartik in a 1391 technical treatise by Geoffrey Chaucer (modern Antarctic Pole). Antarctica has no indigenous population, and there is no evidence that it was seen by humans until the 19th century. However, belief in the existence of a Terra Australis—a vast continent in the far south of the globe to "balance" the northern lands of Europe, Asia and North Africa—had prevailed since the times of Ptolemy in the 1st century AD. Even in the late 17th century, after explorers had found that South America and Australia were not part of the fabled "Antarctica", geographers believed that the continent was much larger than its actual size. According to various organisations (the National Science Foundation,NASA, the University of California, San Diego,Russian State Museum of the Arctic and Antarctic, among others), ships captained by three men sighted Antarctica or its ice shelf in 1820: Fabian Gottlieb von Bellingshausen (a captain in the Imperial Russian Navy), Edward Bransfield (a captain in the Royal Navy), and Nathaniel Palmer (a sealer from Stonington, Connecticut). The First Russian Antarctic expedition led by Bellingshausen and Mikhail Lazarev on the 985-ton sloop-of-war Vostok ("East") and the 530-ton support vessel Mirny ("Peaceful") reached a point within 32 km (20 mi) of Queen Maud's Land and recorded the sight of an ice shelf at 69°21′28″S 2°14′50″W﻿ / ﻿69.35778°S 2.24722°W﻿ / -69.35778; -2.24722 , on 27 January 1820, which became known as the Fimbul ice shelf. This happened three days before Bransfield sighted land and ten months before Palmer did so in November 1820. The first documented landing on Antarctica was by the American sealer John Davis, apparently at Hughes Bay, near Cape Charles, in West Antarctica on 7 February 1821, although some historians dispute this claim. The first recorded and confirmed landing was at Cape Adair in 1895 (by the Norwegian-Swedish whaling ship Antarctic). On 22 January 1840, two days after the discovery of the coast west of the Balleny Islands, some members of the crew of the 1837–40 expedition of Jules Dumont d'Urville disembarked on the highest islet of a group of rocky islands about 4 km from Cape Géodésie on the coast of Adélie Land where they took some mineral, algae, and animal samples. Explorer James Clark Ross passed through what is now known as the Ross Sea and discovered Ross Island (both of which were named after him) in 1841. He sailed along a huge wall of ice that was later named the Ross Ice Shelf. Mount Erebus and Mount Terror are named after two ships from his expedition: HMS Erebus and Terror.Mercator Cooper landed in East Antarctica on 26 January 1853. Antarctica is the coldest of Earth's continents. It used to be ice-free until about 34 million years ago, when it became covered with ice. The coldest natural air temperature ever recorded on Earth was −89.2 °C (−128.6 °F) at the Soviet (now Russian) Vostok Station in Antarctica on 21 July 1983. For comparison, this is 10.7 °C (20 °F) colder than subliming dry ice at one atmosphere of partial pressure, but since CO2 only makes up 0.039% of air, temperatures of less than −140 °C (−220 °F) would be needed to produce dry ice snow in Antarctica. A lower air temperature of −94.7 °C (−138.5 °F) was recorded in 2010 by satellite—however, it may be influenced by ground temperatures and was not recorded at a height of 7 feet (2 m) above the surface as required for the official air temperature records. Antarctica is a frozen desert with little precipitation; the South Pole receives less than 10 cm (4 in) per year, on average. Temperatures reach a minimum of between −80 °C (−112 °F) and −89.2 °C (−128.6 °F) in the interior in winter and reach a maximum of between 5 °C (41 °F) and 15 °C (59 °F) near the coast in summer. Sunburn is often a health issue as the snow surface reflects almost all of the ultraviolet light falling on it. Given the latitude, long periods of constant darkness or constant sunlight create climates unfamiliar to human beings in much of the rest of the world. Few terrestrial vertebrates live in Antarctica, and those that do are limited to the sub-Antarctic islands. Invertebrate life includes microscopic mites like the Alaskozetes antarcticus, lice, nematodes, tardigrades, rotifers, krill and springtails. The flightless midge Belgica antarctica, up to 6 mm (⁄4 in) in size, is the largest purely terrestrial animal in Antarctica. The snow petrel is one of only three birds that breed exclusively in Antarctica. 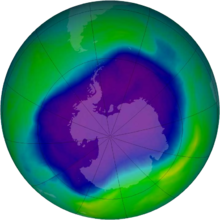 In September 2006 NASA satellite data revealed that the Antarctic ozone hole was larger than at any other time on record, at 2,750,000 km (1,060,000 sq mi). The impacts of the depleted ozone layer on climate changes occurring in Antarctica are not well understood. In 2002 the Antarctic Peninsula's Larsen-B ice shelf collapsed. Between 28 February and 8 March 2008, about 570 km (220 sq mi) of ice from the Wilkins Ice Shelf on the southwest part of the peninsula collapsed, putting the remaining 15,000 km (5,800 sq mi) of the ice shelf at risk. The ice was being held back by a "thread" of ice about 6 km (4 mi) wide, prior to its collapse on 5 April 2009. According to NASA, the most widespread Antarctic surface melting of the past 30 years occurred in 2005, when an area of ice comparable in size to California briefly melted and refroze; this may have resulted from temperatures rising to as high as 5 °C (41 °F). ^ United States Central Intelligence Agency (2011). "Antarctica". The World Factbook. Government of the United States. Retrieved 14 September 2017. ^ "Coldest temperature ever recorded on Earth in Antarctica: -94.7C (−135.8F)". The Guardian. Retrieved 12 July 2017. ^ Aristotle. Meteorologica. Book II, Part 5. 350 BC. Translated by E. Webster. Oxford: Clarendon Press, 1923. 140 pp. ^ Flinders, Matthew. A voyage to Terra Australis (Introduction) Archived 11 November 2012 at the Wayback Machine.. Retrieved 25 January 2013. ^ Armstrong, Terence (September 1971). "Bellingshausen and the discovery of Antarctica". Polar Record. Cambridge University Press. 15 (99): 887–889. doi:10.1017/S0032247400062112. Retrieved 6 January 2015. ^ Bourke, Jane (2004). Amazing Antarctica. Ready-Ed Publications. ISBN 1-86397-584-5. ^ Primary society and environment Book F. Australia: R.I.C. Publications. 2001. p. 96. ISBN 1-74126-127-9. ^ (in French) Voyage au Pôle sud et dans l'Océanie sur les corvettes "l'Astrolabe" et "la Zélée", exécuté par ordre du Roi pendant les années 1837-1838-1839-1840 sous le commandement de M. J. Dumont-d'Urville, capitaine de vaisseau , Paris, Gide publisher, 1842–1846, Vol. 8, pp. 149–152, gallica.bnf.fr, BNF. ^ Jesse, Blackadder, (1 January 2013). "Illuminations : casting light upon the earliest female travellers to Antarctica". ^ Drewry, D. J., ed. (1983). Antarctica: Glaciological and Geophysical Folio. Scott Polar Research Institute, University of Cambridge. ISBN 0-901021-04-0. ^ "How Stuff Works: polar ice caps". howstuffworks.com. Archived from the original on 4 February 2006. Retrieved 12 February 2006. 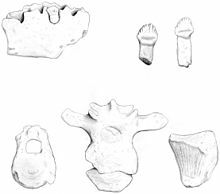 ^ Stonehouse, B., ed. (June 2002). Encyclopedia of Antarctica and the Southern Oceans. John Wiley & Sons. ISBN 0-471-98665-8. ^ Bornemann, Norris RD, Friedrich O, Beckmann B, Schouten S, Damsté JS, Vogel J, Hofmann P, Wagner T., Isotopic evidence for glaciation during the Cretaceous supergreenhouse. Science. 2008 Jan 11;319(5860):189-92. doi: 10.1126/science.1148777. ^ Trewby, Mary, ed. (September 2002). Antarctica: An Encyclopedia from Abbott Ice Shelf to Zooplankton. Firefly Books. ISBN 1-55297-590-8. ^ Retallack, G. J.; Krull, E. S.; Bockheim, J. G. (2001). "New grounds for reassessing palaeoclimate of the Sirius Group". Journal of the Geological Society, London. 158 (6): 925–35. Bibcode:2001JGSoc.158..925R. doi:10.1144/0016-764901-030. ^ Lear, Caroline H.; Lunt, Dan J. (10 March 2016). "How Antarctica got its ice". Science: aad6284. Bibcode:2016Sci...352...34L. doi:10.1126/science.aad6284. PMID 26966192 – via science.sciencemag.org. ^ Agee, Ernest; Orton, Andrea; Rogers, John (2013). "CO2Snow Deposition in Antarctica to Curtail Anthropogenic Global Warming". Journal of Applied Meteorology and Climatology. 52 (2): 281–288. Bibcode:2013JApMC..52..281A. doi:10.1175/JAMC-D-12-0110.1. ISSN 1558-8424. Retrieved 8 January 2018. ^ British Antarctic Survey. "Weather in the Antarctic". Natural Environment Research Council. Retrieved 9 February 2006. ^ "Registro Civil Base Esperanza" (in Spanish). Argentine Army. Archived from the original on 17 January 2010. ^ British Antarctic Survey. "Plants of Antarctica". Natural Environment Research Council. Archived from the original on 7 June 2011. Retrieved 12 July 2011. ^ Chwedorzewska, K.J. (2015). "Poa annua L. in the maritime Antarctic: an overview" (PDF). Polar Record. 51 (6): 637–643. doi:10.1017/S0032247414000916. 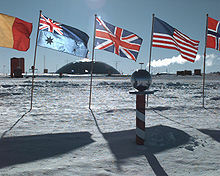 ^ Australian Antarctic Division. "Antarctic Wildlife". Government of Australia. Archived from the original on 28 August 2010. Retrieved 27 September 2010. ^ "The Madrid Protocol". Australian Antarctic Division. Retrieved 22 October 2011. ^ "La Antartica". Library.jid.org. Archived from the original on 7 October 2008. Retrieved 4 November 2008. ^ Afese.com Archived 7 July 2011 at the Wayback Machine.. (PDF) . Retrieved on 19 July 2011. ^ "The World Factbook：Antarctica". CIA. Retrieved 30 October 2016. ^ "NATURAL RESOURCES". CIA. Retrieved 30 October 2016. ^ Graham, Rex (15 July 2014). "Adelie Penguins thriving amid Antarctica's melting ice". Archived from the original on 5 June 2016. Retrieved 24 October 2014. ^ "Meteorites from Antarctica". NASA. Archived from the original on 6 March 2006. Retrieved 9 February 2006. ^ Shepherd, Andrew; Ivins, Erik; et al. (IMBIE team) (2012-11-30). "A Reconciled Estimate of Ice-Sheet Mass Balance". Science. 338 (6111): 1183–1189. Bibcode:2012Sci...338.1183S. doi:10.1126/science.1228102. ^ Shepherd, Andrew; Ivins, Erik; et al. (IMBIE team) (2018-06-13). "Mass balance of the Antarctic Ice Sheet from 1992 to 2017". Nature. 558: 219–222. doi:10.1038/s41586-018-0179-y. Lay summary – Ars Technica (2018-06-13). ^ Rignot, E.; Bamber, J. L.; Van Den Broeke, M. R.; Davis, C.; Li, Y.; Van De Berg, W. J.; Van Meijgaard, E. (2008). "Recent Antarctic ice mass loss from radar interferometry and regional climate modelling". Nature Geoscience. 1 (2): 106. Bibcode:2008NatGe...1..106R. doi:10.1038/ngeo102. PMC 4032514  . ^ Chen, J. L.; Wilson, C. R.; Tapley, B. D.; Blankenship, D.; Young, D. (2008). "Antarctic regional ice loss rates from GRACE". Earth and Planetary Science Letters. 266 (1–2): 140–148. Bibcode:2008E&PSL.266..140C. doi:10.1016/j.epsl.2007.10.057. ^ Steig, E. J.; Schneider, D. P.; Rutherford, S. D.; Mann, M. E.; Comiso, J. C.; Shindell, D. T. (2009). "Warming of the Antarctic ice-sheet surface since the 1957 International Geophysical Year". Nature. 457 (7228): 459–462. Bibcode:2009Natur.457..459S. doi:10.1038/nature07669. PMID 19158794. ^ Gillett, N. P.; Stone, D. I. A.; Stott, P. A.; Nozawa, T.; Karpechko, A. Y.; Hegerl, G. C.; Wehner, M. F.; Jones, P. D. (2008). "Attribution of polar warming to human influence". Nature Geoscience. 1 (11): 750. Bibcode:2008NatGe...1..750G. doi:10.1038/ngeo338. ^ Steig, E. J.; Ding, Q.; White, J. W. C.; Küttel, M.; Rupper, S. B.; Neumann, T. A.; Neff, P. D.; Gallant, A. J. E.; Mayewski, P. A.; Taylor, K. C.; Hoffmann, G.; Dixon, D. A.; Schoenemann, S. W.; Markle, B. R.; Fudge, T. J.; Schneider, D. P.; Schauer, A. J.; Teel, R. P.; Vaughn, B. H.; Burgener, L.; Williams, J.; Korotkikh, E. (2013). "Recent climate and ice-sheet changes in West Antarctica compared with the past 2,000 years". Nature Geoscience. 6 (5): 372. Bibcode:2013NatGe...6..372S. doi:10.1038/ngeo1778. ^ Payne, A. J.; Vieli, A.; Shepherd, A. P.; Wingham, D. J.; Rignot, E. (2004). "Recent dramatic thinning of largest West Antarctic ice stream triggered by oceans". Geophysical Research Letters. 31 (23): L23401. Bibcode:2004GeoRL..3123401P. doi:10.1029/2004GL021284. ^ Thoma, M.; Jenkins, A.; Holland, D.; Jacobs, S. (2008). "Modelling Circumpolar Deep Water intrusions on the Amundsen Sea continental shelf, Antarctica". Geophysical Research Letters. 35 (18): L18602. Bibcode:2008GeoRL..3518602T. doi:10.1029/2008GL034939. ^ Pritchard, H. & D. G. Vaughan (2007). "Widespread acceleration of tidewater glaciers on the Antarctic Peninsula". Journal of Geophysical Research. 112. Bibcode:2007JGRF..11203S29P. doi:10.1029/2006JF000597. ^ Bromwich, David H.; Nicolas, Julien P.; Monaghan, Andrew J.; Lazzara, Matthew A.; Keller, Linda M.; Weidner, George A.; Wilson, Aaron B. (2013). "Central West Antarctica among the most rapidly warming regions on Earth". Nature Geoscience. 6 (2): 139–145. Bibcode:2013NatGe...6..139B. doi:10.1038/ngeo1671. ^ Schiermeier, Quirin (12 August 2009). "Atmospheric science: Fixing the sky". Nature. Nature Publishing Group. 460 (7257): 792–795. doi:10.1038/460792a. PMID 19675624. Retrieved 7 October 2009.